Dr. Brefczynski-Lewis went on to study functional magnetic resonance imaging (fMRI) technology at the Medical College at Wisconsin and even scanned the brains of meditating monks at the University of Wisconsin Madison to study whether positive emotions like loving kindness and compassion can be learned in the same way the brain learns to playing a musical instrument or a sport. 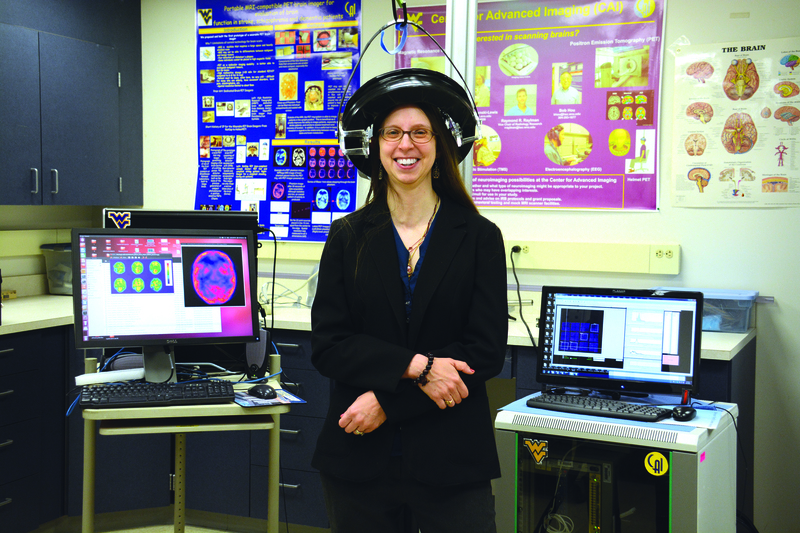 Today, Brefczynski-Lewis, a research assistant professor at the WVU Center for Neuroscience, is part of a collaborative team of scientists using a portable brain scanner to study the human brain in motion. She is the lead neuroscientist of the WVU team in the BRAIN Initiative (Brain Research through Advancing Innovative Neurotechnologies), launched by President Obama in 2013 as a national effort to equip researchers with the fundamental support necessary for treating a wide variety of brain disorders. The WVU-led team was one of the first groups in the country to receive White House recognition and National Institutes of Health support for more than $1.5 million. “The portable PET scanner opens up a whole, new niche. We hope to be able to go into an area of science that was previously off limits. Being able to monitor people in motion while laughing, crying, and interacting with other people – the possibilities are endless,” Brefczynski-Lewis said. The portable human brain scanner was suggested by physicist Stan Majewski, PhD, a former WVU faculty member now at the University of Virginia. Dr. Majewski and Brefczynski-Lewis obtained a grant to construct the first prototype device for a human. It’s a helmet with small, square-shaped positron emission tomography (PET) detectors around it. The light, moveable design will allow researchers to perform a variety of functions like observing the brain of a person with a mental illness, a person with autism in a social situation, a stroke patient during rehabilitation exercises, or someone with Parkinson’s disease experiencing tremors or walking difficulties. “Right now, it’s all about potential – what can we study? We wanted to demonstrate that we could scan a moving brain. A regular PET scanner weighs several tons and requires patients to keep their head still and wear a mask. The portable scanner moves with your head, so you can get a nice brain image while you are moving,” Brefczynski-Lewis said. In addition to allowing freedom of movement, the PET helmet will require far less of the radioactive tracer material currently used in traditional PET imaging. “Because it’s so close to the head, we will be able to use a much lower and safer dose,” Brefczynski-Lewis said. Brefczynski-Lewis hopes that future observations with the PET helmet will help to end stigma about mental illness. “I want people to accept that they have an imbalance, and they are not doing something wrong. This is something that is treatable just like diabetes – it just happens to be in your brain,” she said. Her team is now building a new PET helmet with higher resolution that is fully comparable to a clinical PET scanner. The multidisciplinary team of brain researchers in addition to Brefczynski-Lewis and Majewski, includes Alexander Stolin, PhD, at WVU; Ravi Manjeshwar, PhD, and Sergei Dolinsky, of General Electric; Jinyi Qi, PhD, of the University of California, Davis; and Paul Kinahan, PhD, of University of Washington. Scanning the brains of meditating monks piqued Brefczynski-Lewis’ interest in the effects of positive emotions like compassion on the human brain. At WVU, she has continued to examine meditation and compassion and how positive emotions affect a person’s stress levels. A compassion meditation phone app Brefczynski-Lewis developed enables study participants to easily incorporate a meditation practice into their schedules. More than 30 participants have used the app, including nurses, students, and physical therapists. WVU Healthcare cardiac rehabilitation nurse, Bonnie Wolfe, RN, pictured at right, had never heard of compassion meditation before the study. She wanted to learn techniques she could share with her patients to help them manage their stress levels. The study wound up having many positive benefits on Wolfe herself. “The first week, it was very difficult. Your mind wanders and you think of all the different things that you have to do in your day. Then, you have to bring yourself back and get into the breathing and meditation,” she said. Wolfe used the methods that she learned from the app at work, and she also found the compassion meditation skills to help her have a more optimistic attitude on the job. “Being in a stressful situation or knowing that you have to deal with a difficult person, you can practice compassion meditation before you have an interaction with them and think about how you are going to react. You can learn not to let someone anger you and keep yourself in check. Skills like these help in every line of life,” she said. Wolfe teaches compassion meditation skills to her cardiac patients, tells them about the benefits of deep breathing, and shows them what to do. “I believe that exercise is very important for stress relief and overall health. But, the mind controls a lot in your body, and you can make a huge difference by taking care of that, too,” Wolfe said. Jessica Fowler, a junior at the WVU School of Nursing, participated in Brefczynski-Lewis’ study, and it was also her first in-depth exposure to meditation. “At first, it was hard for me to count my breaths, and I kept thinking about everything else that was going on in my day, but by the end of the study after practicing the exercises more, I learned how to focus, and meditating came more naturally to me. I still use the app. It gives me a more positive outlook on stressful situations,” Fowler said. App users send survey results about each of the exercises back to Brefczynski-Lewis to examine. “Compassion meditation can affect the amygdala, an area of the brain that can be associated with emotion. When people saw pictures of their enemies, the right amygdala lit up. After doing compassion meditation, it no longer was activated,” she said. Brefczynski-Lewis plans to make the app accessible to the general public this summer, and she is nearing completion of the first app study. The next phase will be using the app with heart disease patients who might also be experiencing stress or anxiety that aggravates their chronic physical condition.